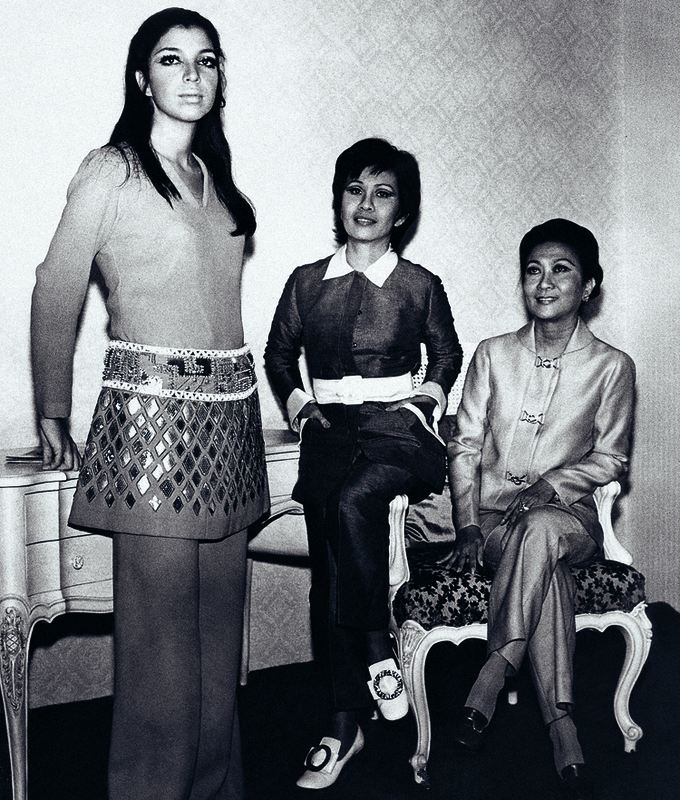 During the ‘60s the founding sisters also ran a successful atelier at the same time as the school, and perfected what was to be known as the “Slim’s Method” which came about from the technical proficiency developed and transcribed into formal lessons for the school. 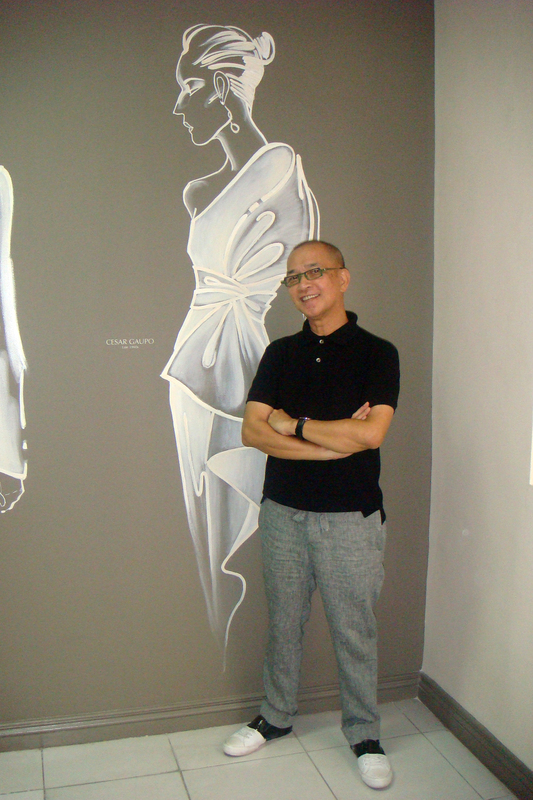 It is this proficiency that has produced design superstars both locally and abroad over the last five decades such as Joe Salazar, Oskar Peralta, Cesar Gaupo, Joey Samson, Michael Cinco, Ezra and Oliver Tolentino. Those based overseas, as in the case of Ezra, tend to look back at the school to hire assistants, perpetuating the opportunities for graduates who have now enhanced their talent and skills. “The majority of students who enroll at our school can’t draw beyond stick figures, or sew a stitch,” intimates Sandy. “The ‘Slim’s Method’ of teaching was designed to address that. Halfway through their courses, students are often amazed at what they can do…it’s a remarkable transformation.” Between the Higgins siblings, it is Mark who is more hands-on with the school. “Mark is very much my mother’s son, having inherited her sense of aesthetic, her sense of daring, and her rather exacting standards,” says Sandy. After Mark gained his degree in Fine Arts he went to Parsons in New York and worked with his mom for several years in between his university days and immediately afterwards. Mark has also designed costumes for theater and ballet, and in the last decade has been painting, exhibiting his work in NY, Paris, Washington, Hong Kong and Tokyo. It is his direct involvement with the teachers, students and their work that has reignited the creative fire and public interest in Slim’s. In the recent Preview magazine’s Emerging Fashion Talent Awards two out of the five winners were Slim’s students, namely Riza Bulawan and Erika Adona. What makes the Slim’s education different? The directors believe that fashion enables people to cross economic barriers and in doing this has kept its tuition fees accessible to students from all demographics. “The great equalizer is talent,” says Sandy. “There are those who either cannot afford to do a four-year course, or those who don’t want to, who precisely need to learn some sort of vocation, in order to find their calling and earn a living.” Courses are also offered individually; fashion design for example is a full diploma course as is patternmaking/dressmaking. There are also short workshops to supplement, such as the business of fashion. The advantage in this method is that every student gets to choose exactly what he or she wants to learn. It is precisely because they get to choose what they what to learn that students have a greater chance in excelling. Lessons are both hands-on and practical, and strive to be relevant to the local industry. “Our strength as Filipinos lies in our creativity and our artisanal abilities,” remarks Sandy “The Philippines is not, and never will be, a great manufacturing center. We can’t compete with countries like China and Vietnam. It’s not in our DNA. But what we do have is a large dose of creative talent, and a penchant for craftsmanship.” It is because of this that the Higgins siblings make it the school’s thrust to empower their students with extensive skills, their Fashion Design students begin their course with a foundation of fine arts, to give them a deeper sense of aesthetics, before ever drawing a single fashion sketch. Slim’s celebrates its foundation month this October, kicking off with an exhibition of current students’ works at the Slim’s Fashion and Arts School. The exhibit features “tribute walls” where some of the school’s illustrious alumni drew designs in the hallway walls. There were also framed sketches made by students which showed influences over and above just a “passion for fashion.” One sketch appeared to be a gown inspired by fans while another inspired by the feathers and wings of crows. The garment projects saw layers of fabric that defied gravity, clean, polished lines on corset-like tops, contrasting colors for any up and coming pop diva and of course elegant ensembles for a chic Cinderella on her way to the ball. Looking at the end product, it was pretty hard to imagine that most of the students weren’t already seasoned designers. Perhaps due to the unique mentoring style at the school, the students allowed their imagination to move them from their current reality into the limitless universe of true creation. “My mom never subscribed to the belief that ‘it can’t be done here.’ It isn’t just about what’s already been done, it’s about what we can and will, aim to do, as Filipinos,” intimates Sandy. Here’s to our fashion futures. 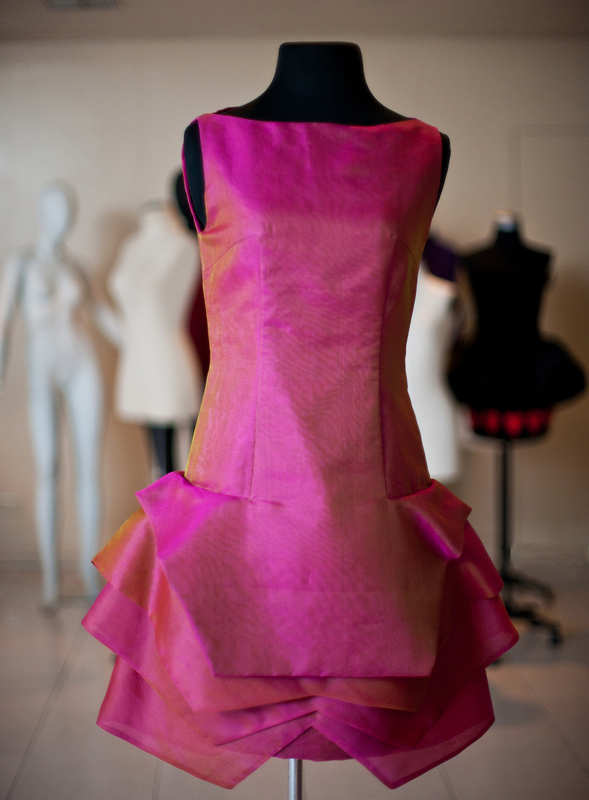 Slim’s Fashion and Arts School exhibit runs until Oct. 20. 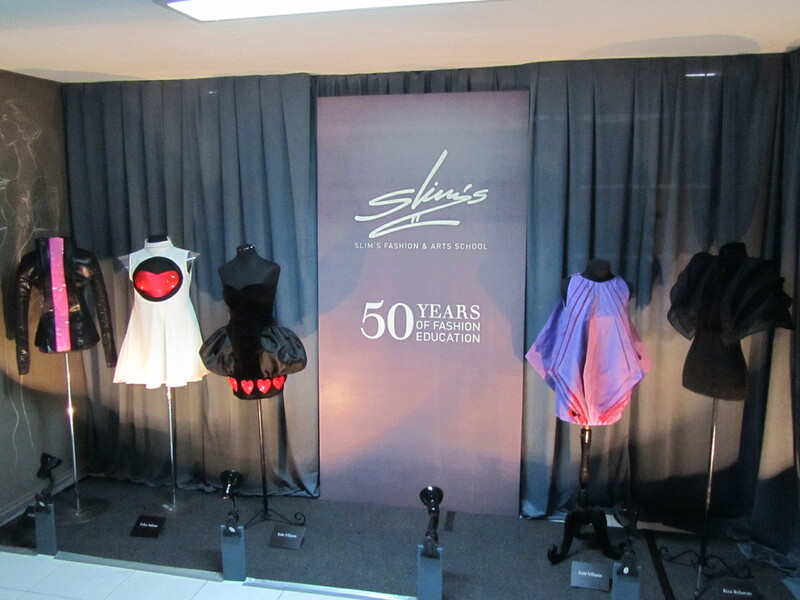 Watch for “Slim’s School at 50,” a fashion show to salute the achievements of Slim’s alumni through the last five decades. The lineup will include Oskar Peralta, Cesar Gaupo, Joe Salazar, Chito Vijandre, Ezra, Michael Cinco, Joey Samson, Martin Bautista, James Reyes, and a glimpse of the school’s new stars, on Oct. 29 at Philippine Fashion Week. For more information on Slim’s Fashion and Arts School, call 887-3390/92 or go to www.slimsfashion.com.